We're here, we’re queer, and in full bloom for Pride Season! This year, PARADISE, our annual queer utopia Pride party, returns with the theme FLORAL FORMAL. We’re bringing the Flower Power to Michelle's Ballroom for an evening featuring botanically inspired cocktails by Lost Lake and microbrews from Hopewell Brewing. Slo ‘Mo Resident Vibe Curator Audio Jack will be joined by Party Noire’s Rae Chardonnay for a double dose of DJ magic playing your favorite R&B jams all night long.. Tristen Winfield will bring all her charm as our MC, and Hijo Prodigo and Darling Shear will be judging you- for out Best Dressed Floral Formal Floral so inspired attire is STRONGLY encouraged so that we can create an immersive experience you’ll remember for years to come. Your ticket includes open bar all night and Lost Lake doesn’t do anything half-way. We are so honored to partner with this phenomenally creative, award-winning team, recently recognized for the second year in a row by Saveur as One of the World’s Best Bars. Anticipate a variety of beautiful cocktail creations featuring the following high quality spirits: Cava Brava Rum, Ford’s Gin, Tequila Cabeza, and Aylesbury Duck Vodka, a bevy of beers provided by Logan Square’s delish and delightful Hopewell Brewing, and Perrier sparkling water to keep you refreshed. Treat your bestie or bae with a gift from Asrai Garden, who will be selling floral accoutrements at cost just for Slo 'Mo fam: Flower crowns ($30) & boutonnieres ($10). Place your order in person at 1935 W. North Ave or give them a ring, then pick up & pin on when you arrive at the Ball! We’ll have a Midnight Snack ushered in to soak up those tiki drink delights, and plenty more surprises to be announced as we lead up to the party. Floral decor means photos galore: A custom photobooth will capture you in your best with your baes. Check out our Pinterest board for attire inspo. The Ballroom is located at the corner of California and Belmont. It is .7 miles from the Belmont Blue Line, and accessible by the 77 and 52 buses. There are two free parking lots located on Elston and California. The entrance is street level and on Belmont, with bathrooms located on the first floor for wheelchair accessibility. All bathrooms will welcome all genders, as always! Early bird tickets are very limited and available for $65, which will increase as we get closer to the party. As always, we prioritize intimacy in our spaces, and thus, capacity is limited. In other words, don’t sleep on those tickets. Pining to attend but light on cash flow? There are limited volunteer opportunities in exchange for tickets. Email slomoparty@gmail.com to learn more. Slo ‘Mo Party is a platform! 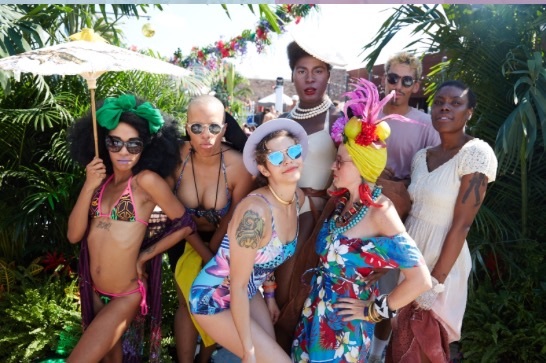 We strive to create as many opportunities as possible with our special events: Our vendors, partners and performers are majority queer, femme and/or POC identified individuals and businesses. The party is lovingly produced by Slo ‘Mo co-founder Kristen Kaza under No Small Plans Productions. Floral graphics created by the fam Lauren Black of Lesbifriends. Check out pix from our legendary Paradise Pride parties of past!